Hi-fi sound on your ears? No points for guessing what Blue Microphones is best known for, but the manufacturer is now nudging its way into the headphone market, offering up something that it hopes will appease the audiophiles among you. 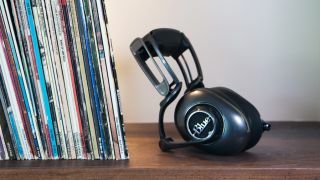 Blue's cans pack in an analogue "audiophile" amplifier to boost and clean music from weak sources such as smartphones, with two 50mm hi-fi drivers and an amp with a 240W output. You've also got three settings to play with: On, which activates the amp; On+, which turns on the amp's analogue low-frequency enhancement circuit; and Off, which puts the headphones into passive mode. As for the design, they're a pair of headphones that look perfect for using around the house, but they might draw a few glances on the morning commute. However, the structure has been considered quite carefully, supposedly removing the stress points that come with so many other headphones. We're told we'll get 12-15 hours of audio playback, and can expect to see them available from today in the US at $350 (around AU$375), and soon in the UK at £275.